If you are familiar with Magician's DIY Tips and Tricks then Tricks of the Trade is written with a very similar idea in mind just 60 years prior. It describes a multitude of DIY tips and gimmicks and improvements for the magician. How to turn a sock into a billiard ball holder. The two ingredients to make fake beer. How to make a candle shell. How to make coin holders from pins and safety pins. How to make colored flash paper. It closes with a section on stage make-up. 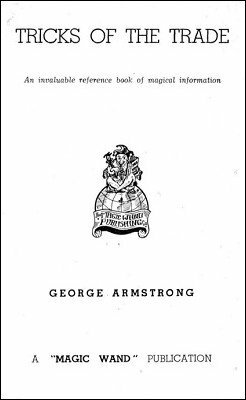 1st edition 1949, PDF 22 pages.